First to publish the Declaration of Independence the London Chronicle appeared three times a week. 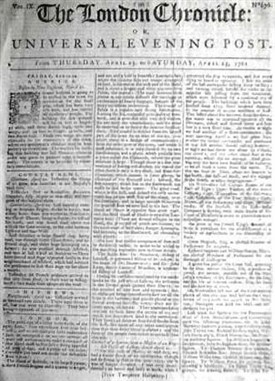 It was published from July 1765 to 1823 and was later absorbed by other newspapers; it was a Georgian London paper. 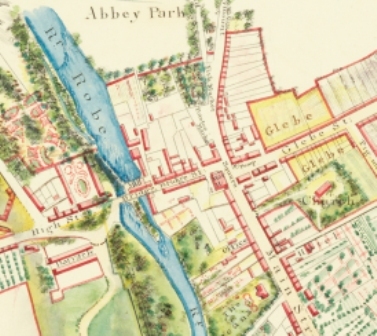 We learn from Ballinrobe that on Saturday last at about the dead hour of night, upwards of twenty soldiers of General Kennedy's regiment went in a body to the gaol in said town, broke it open and set at liberty two of their comrades who had been there confined on account of the late riot, at the fair, eve of the said town. 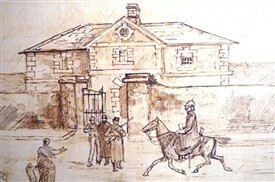 In the dispute the gaoler was shot dead and one Flynn, an assistant, was desperately wounded. The whole party concerned in this have not have been secured. The Bridewell, established c 1760's was the site of many hangings and the town stock. It was located near the corner with the Neale Road and the Bridewell (jail) contained four cells, three day-rooms, and two airing yards, with other requisite rooms/accommodation. Rough justice was dispensed here, including hangings but by 1877 permission was given by the Lord Lieutenant, John Winston Spencer-Churchill, 7th Duke of Marlborough (1822-1883) who served from 1876 to 1880, to close it. Its activities were moved to the Market/Court House on Main Street. This page was added by Averil Staunton on 15/08/2013. Ballinrobe Mask Players - "The importance of being Ernest" Do you know what year this play took place?